MOPIA’s 25th Annual General Meeting will be held on Thursday, May 9, 2019 in Winnipeg. Plan to come hear about MOPIA’s activities and join industry stakeholders in this free lunch event. Parking is also free at this location! There is no cost to attend and participants enjoyed a complimentary meal and info with reports from our Chair, Treasurer, Executive Director and Nominations Committee. If you are interested on being considered for MOPIA’s Board of Directors, complete a Nominations Paper attached and/or call MOPIA for details. MOPIA is hosting a series of free program awareness and Manitoba ODS 103/94 regulation consultation sessions beginning June 4th 2019 in Dauphin. Participants will hear the latest and are encouraged to share ideas and any concerns. They are being conveniently held in a location near you and are short in duration. Also, a complimentary breakfast or lunch and parking is provided. Please register in advance by emailing MOPIA (mopia@mymts.net), phoning (204.338.2222/1.888.667.4203) or using the form below. This is just to better ensure we order enough food and have adequate information for each event. Please find attached an Information Note on the Regulations Amending theOzone-depleting Substances and Halocarbon Alternatives Regulations (the Amendments) that provides important information on the consumption allowance system for hydrofluorocarbons (HFCs). A new research paper recently published (January 4, 2018) in the Geophysical Research Letters “Decline in Antarctic Ozone Depletion and Lower Stratospheric Chlorine Determined From Aura Microwave Limb Sounder Observations” highlights that inorganic chlorine is the catalyst in destroying ozone in the upper atmosphere, the stratosphere. While this was often assumed, this is Paper is seen as providing the first direct proof that the ozone hole is recovering due to less chlorine (chemicals) in the stratosphere. 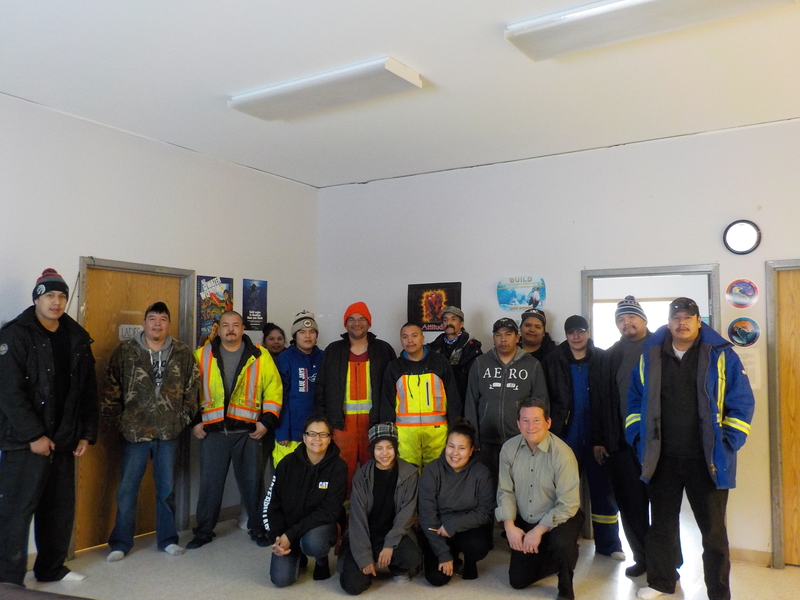 On February 28, 2018, MOPIA in collaboration with CIER, provided certification training to 17 First Nations waste management specialists. A picture of the group is below. On October 5, 2016, Canada’s Parliament ratified the Paris Agreement on Climate Change. It becomes effective on November 4, 2016. Canada’s provinces will have to develop an approach to address climate change or the federal government will intervene. “From the earliest days of our government’s mandate, as Minister of Environment and Climate Change, I have been invested in the Paris Agreement. In December 2015, I led Canada’s delegation to COP21, where Canada played an instrumental role in reaching that historic agreement to keep the global temperature increase below 2 degrees Celsius. And where Canada fought to make sure Indigenous rights were recognized in the Agreement by all 195 countries that signed on. And I was there when Canada signed the Paris Agreement on April 22, Earth Day. “Today, Parliament voted to support the ratification of the Paris Agreement, true to our commitment to do so this year. And once again, Canada is a leader on climate change. Our action will bring the world over the threshold of 55 countries accounting for 55 percent of global greenhouse gas emissions needed to bring the Paris Agreement into force. “Here at home, we continue to work for Canadians, including Indigenous peoples, businesses, and the provinces and territories. We remain committed to developing a Canadian plan for clean growth and climate change to support families and businesses in making our country cleaner and more competitive. “We are the first generation to truly feel the effects of climate change, and the last that is able to do something about it before it is too late. Canada’s children will remember today as the day the world did something about it. Environment and Climate Change Canada (ECCC) under the Canadian Environmental Protection Act (CEPA) has published a Notice Requiring the Preparation and Implementation of Pollution Prevention Plans in Respect of Halocarbons Used as a Refrigerant in the Canada Gazette, Part I. 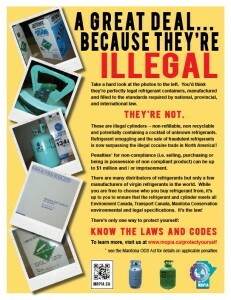 This Notice is published under Part 4 of the Canadian Environmental Protection Act, 1999 (CEPA 1999). This Notice was developed in consideration of all comments received from stakeholders further to the publication of the proposed Notice on April 18, 2015. A document containing the responses to comments received during these consultations is posted here at http://www.ec.gc.ca/planp2-p2plan/default.asp?lang=En&n=40C4637C. 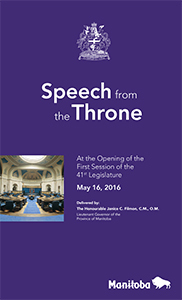 A copy of the Notice can be found at http://www.gazette.gc.ca/rp-pr/p1/2016/2016-05-21/html/sup2-eng.body.html. 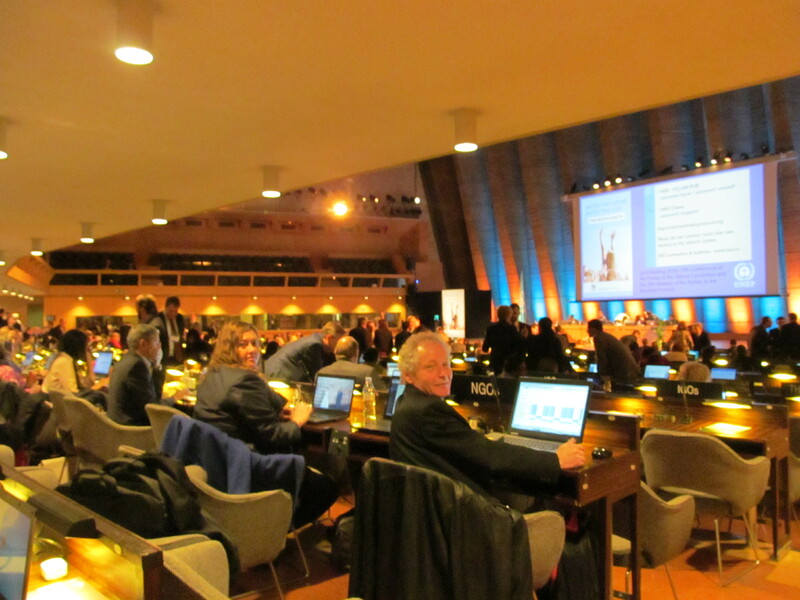 The 37th Meeting of the Open-Ended Working Group of the Parties to the Montreal Protocol took place in Geneva, Switzerland, 4-6 April. Some progress was made in considering a pathway forward to include and control HFCs but no formal agreement was reached. 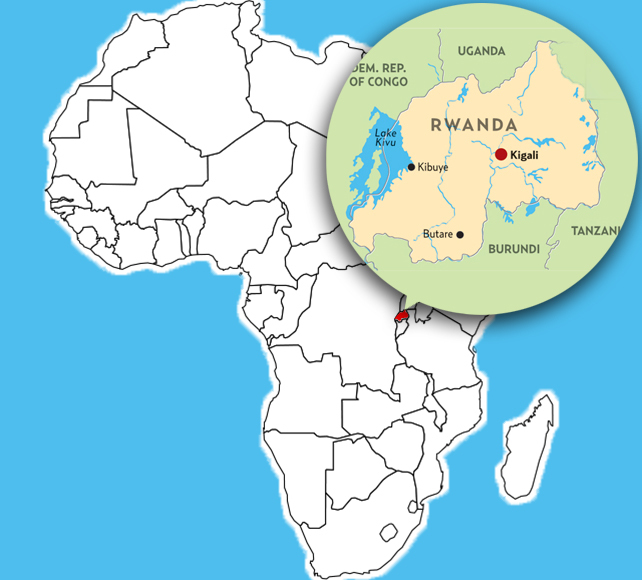 Parties will be meeting again in Vienna, Austria in Summer 2016 at an intersessional meeting to possibly formalize an amendment in time for the in next Montreal Protocol meeting set for October 2016 in Rwanda. Click on the link above to access a 2015 renewal Secondary Distributor Permit form or below for a Record Data Form. Consumers should be cautious that topping-up of a regulated refrigerant is prohibited and adding a different refrigerant into an existing A/C system inappropriately has risks – see our poster below…..
You are invited to attend one of MOPIA’s industry awareness sessions. 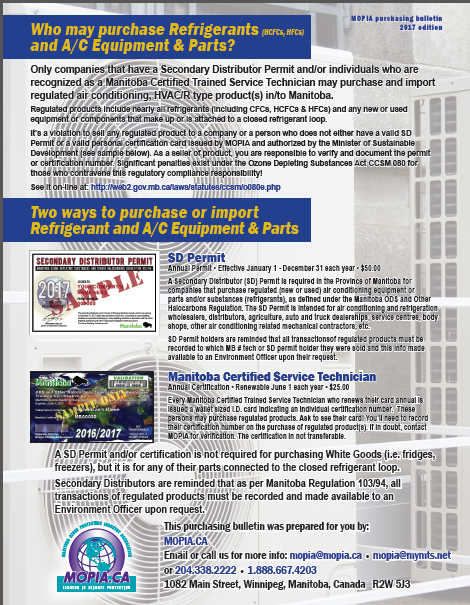 The events are taking place across Manitoba and are aimed at our stakeholders who use, purchase and handle refrigerants. The events are free and will include information packed into an hour long PowerPoint session. Learn about your regulatory obligations, new and emerging refrigerants and industry technologies. MOPIA officials will be present to answer questions and hear your concern. Dates and locations will be posted on the registration form below. NEXT Session: April 14, 2018 in Winnipeg at RRC. MOPIA’s regularly holds “one day-all day” certification training sessions throughout the year upon need by our stakeholders. If you are interested in attending one of this session, please fill out the training application form seen below and return it to us through email, fax or mail. We will keep this application on file, and alert you on the next session date. MOPIA is also looking into on-line and self-study options to accommodate our rural stakeholders. If this applies to you please contact us for more details. MOPIA is a Switch the Stat Depot at 1082 Main Street. Hours to drop off switches are 8:30 am – 4:30 pm weekdays. MOPIA’s 24th AGM will be held on April 10, 2018 in Winnipeg at MOPIA. View the 2015/16 Annual Report (below). You are invited to attend one of MOPIA’s industry awareness sessions. The events will take place across Manitoba and are aimed at our stakeholders who use, purchase and handle refrigerants. The events are free and will include information packed into an hour long PowerPoint session. Learn about your regulatory obligations, new and emerging refrigerants and industry technologies. MOPIA officials will be present to answer questions and hear your concerns. Register early to reserve a seat. Email MOPIA your name and location selection. Seats may be limited at venues. All locations will be confirmed by email to those registered and posted on our website. Obtain your registration form at our website or by contacting us. A registration form was also just mailed to our members. Hope to see you there! 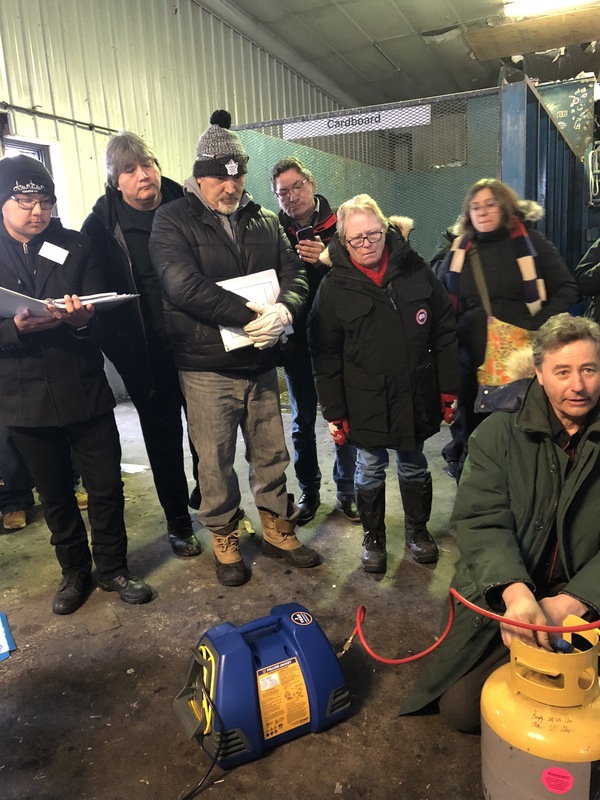 MOPIA provided provincial ODS certification training in Thompson, Manitoba in February 2019 to several KTC members, in addition to provincial (Sustainable Development) and federal (ISC) government officials. The training was aimed at the recovery of refrigerant from appliances and can be applied to automobile air conditioning refrigerant recovery too. 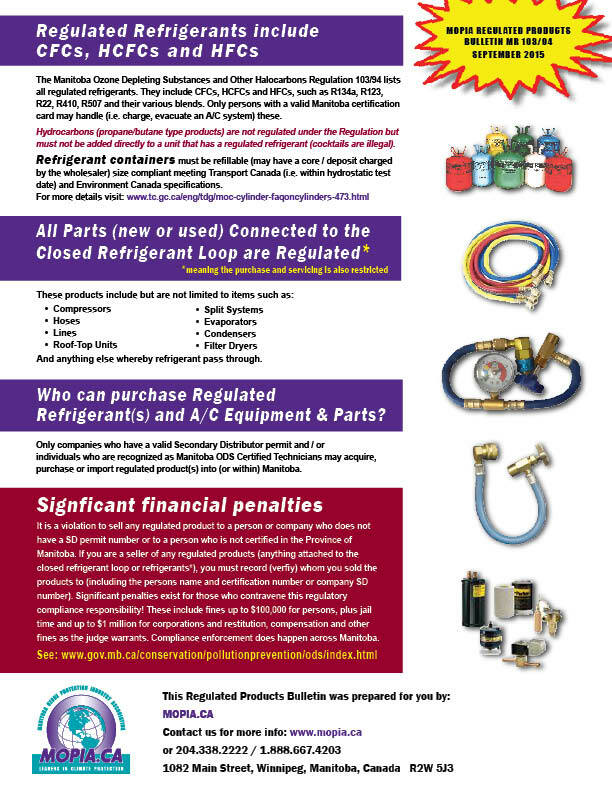 Several communities have abandoned or scrap white goods and autos that contain regulated refrigerants that must be recovered as per Manitoba Regulation 103/94 and to protect the environment. 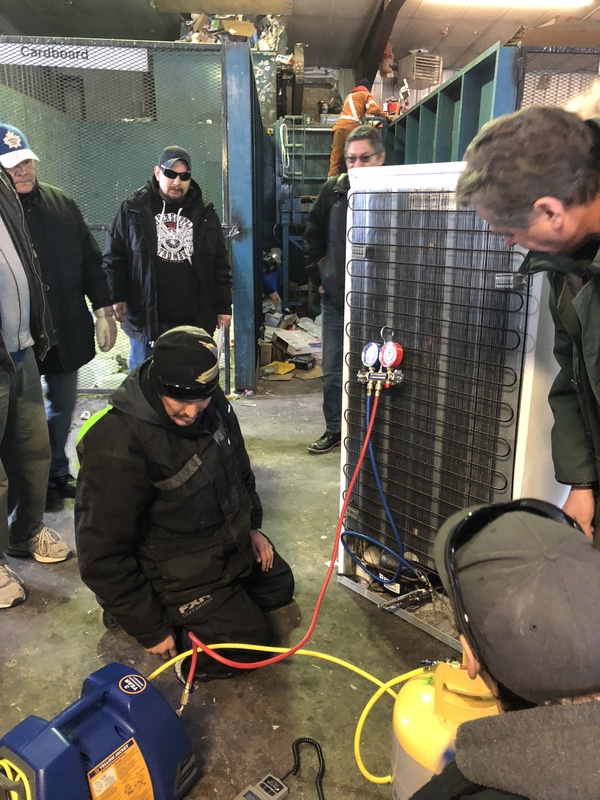 Pictured above is MOPIA trainer Kirk Esau who provided the hands-on refrigerant recovery (demo) training. 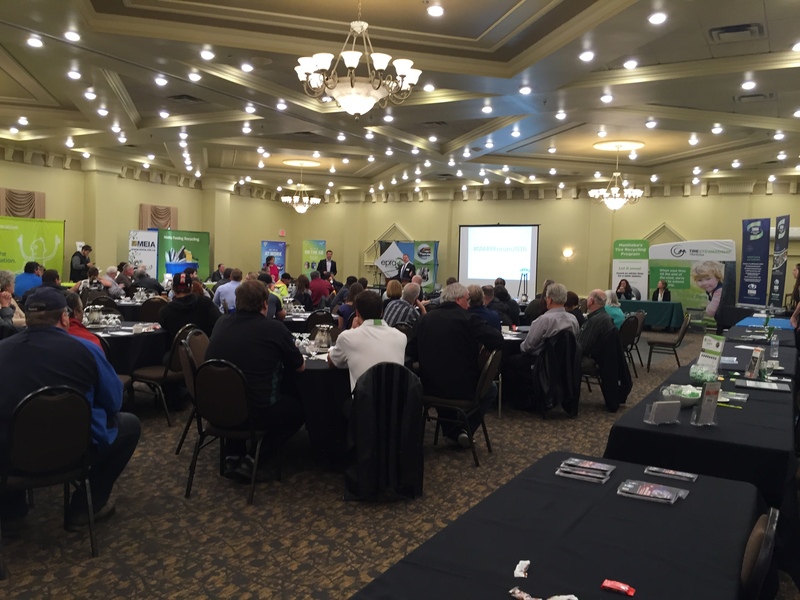 Genoa de Bruin presented at this years MARR Forum in Winnipeg, November 8. She highlighted the importance of properly disposing of white goods, including the recapture/recovery of the refrigerant gases and other elements, such as mercury, oils and possible other contaminants. White goods such as fridges, freezers, dehumidifiers and water coolers have as much impact driving 17,000 kms in one year and can reduce our carbon footprint by up to 3 tonnes each! Genoa also shared that options exist for municipalities to properly manage their white goods. They may contract with a recognized company to dispose of their white goods, train staff to do it on-site or a combination of the two. The key being that it is mandatory to recover the refrigerant before any unit is crushed or discard to a scrap dealer for dismantling or shredding. The primary purpose of the proposed regulations to amend the Ozone-depleting Substances and Halocarbon Alternatives Regulations would be to permanently correct the Canadian hydrofluorocarbons (HFC) consumption baseline, which was modified with an interim order in October 2018. As a first step in the consultation process, interested parties may submit comments by mail or email by January 2, 2019, to the contact provided below. Subsequently, a consultation document will be published in 2019 to gather additional information from stakeholders. Interested parties will have another opportunity to make written comments specific to the regulatory proposal during the mandatory consultation period that will follow the publication of the proposed regulations in 2019. 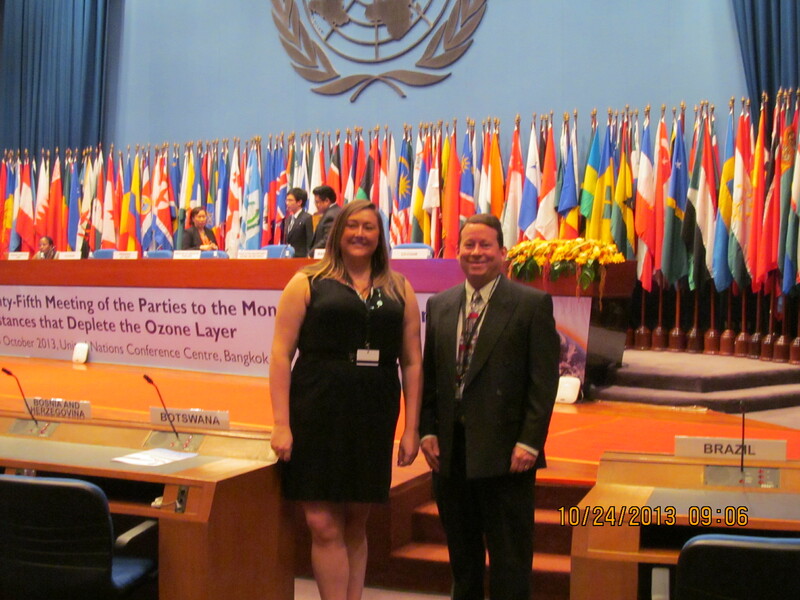 MOPIA`s Chair and Executive Director attended the 30th Meeting of the Parties of the Montreal Protocol Meeting in Quito, Ecuador November 5-9. MOPIA’s next one-day certification training class is Saturday, May 11th in Winnipeg at Red River College. Contact us for details or to register. Typically, during winter, air conditioning in several sectors slows down and fewer class sessions are held. MOPIA will host a class whenever there is a need and at least 8 or more applicants. MOPIA does classes throughout Manitoba from Brandon to Winkler and Winnipeg. If you have a need or enough applicants, lets see how we can make it work. 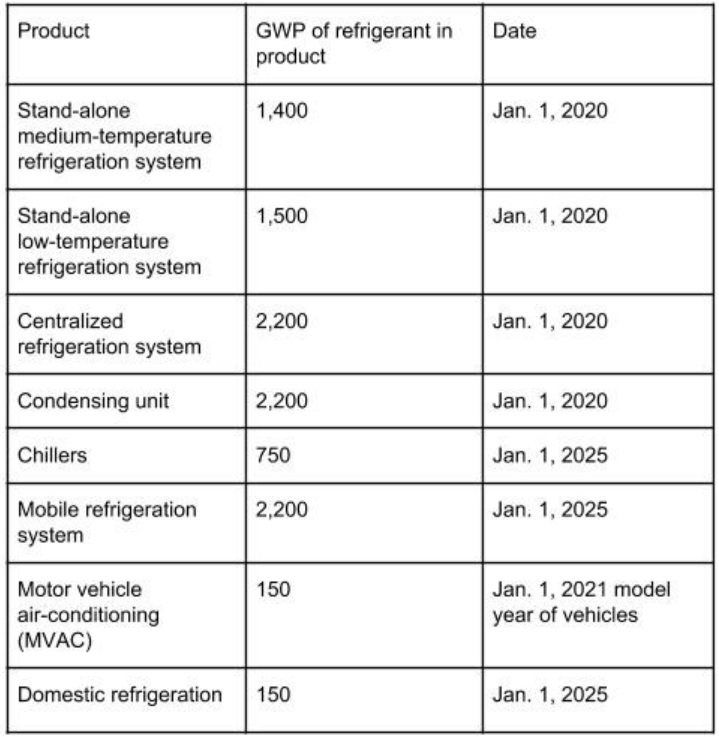 The manufacture of new equipment with of high-GWP HFCs will be restricted based on the dates seen. Important note: The Regulations Amending the Ozone-depleting Substances and Halocarbon Alternatives Regulations (the Amendments) have been published in Part II of the Canada Gazette. Global action to reduce HFC emissions can prevent up to 0.5°C of global warming due to the high Global Warming Potential of these chemicals. 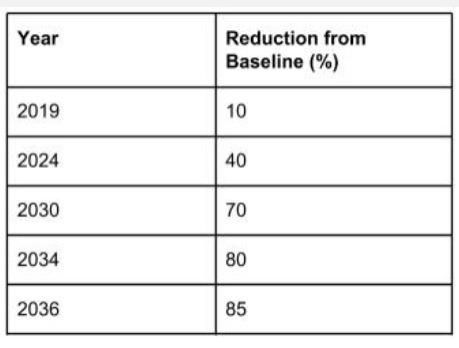 Between 2018 and 2040, the Amendments are expected to result in cumulative GHG emission reductions from HFCs of 168 Mt CO2e. This report summarizes and consolidates the feedback received during the four consultation sessions that took place across Canada. MOPIA will be hosting a series of free program awareness sessions. Plan to attend, hear the latest and share your concerns! They are conveniently being held in a location near you and are short in duration. Also, enjoy a complimentary breakfast or lunch, bring co-workers. Please register in advance by emailing MOPIA (mopia@mymts.net), phoning (204.338.2222/1.888.667.4203) or using the form below. This is just to better ensure we order enough food and have adequate information for each event. Actual dates and location to be posted in early 2019. 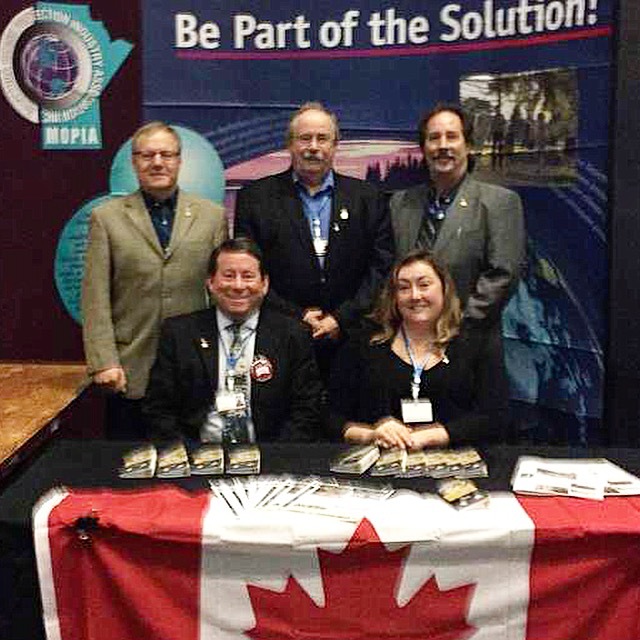 MOPIA hosted a booth and actively engaged in the side events and participated in the formal Meeting of the Parties November 24-28 in Montreal. MOPIA met representatives from dozens of countries around world and shared our expertise on addressing ozone depleting and climate change substances. 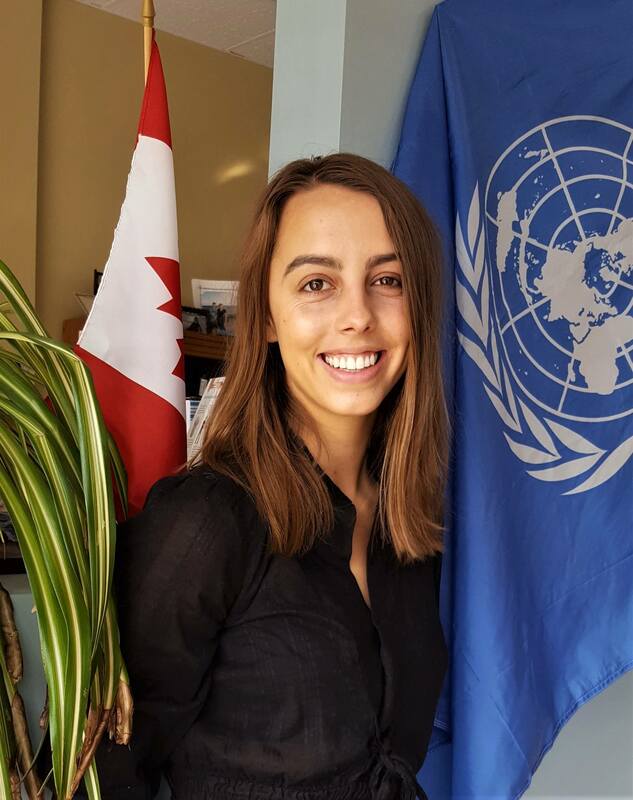 Manitoba is unique to world in many approaches to stewardship of harmful substances. Below, see our strong MOP 29 MOPIA team: Kent Cielen, Don Thomson, John Kubilanski, Mark Miller and Meghan Skorodenski. Mark pictured below with RM of Springfield Reeve Bodnaruk, Councillor Erickson, PureSphera Recycling Rep. Melissa Leclerc. Also seen, MOPIA’s Booth at the 2016 Forum. 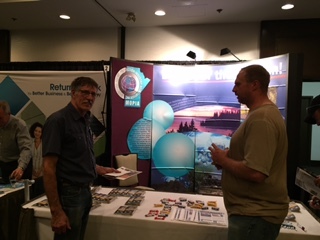 MOPIA attended the HRAI Manitoba Education Seminar and Hosted a Booth at their Tradeshow, October 12 in Winnipeg. An archive of our monthly Bulletins can be found under the Bulletin menu tab. The date and location of the 25th AGM will be posted in early 2019. Please return here for details. 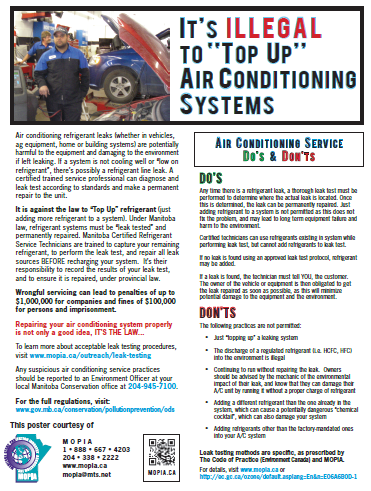 Every certified technicians must report the use (or not) of any and all regulated substances (refrigerants and halons) by February 1 documenting use for the previous year (i.e. 2016) to MOPIA. Contact MOPIA is you require guidance or have any questions. 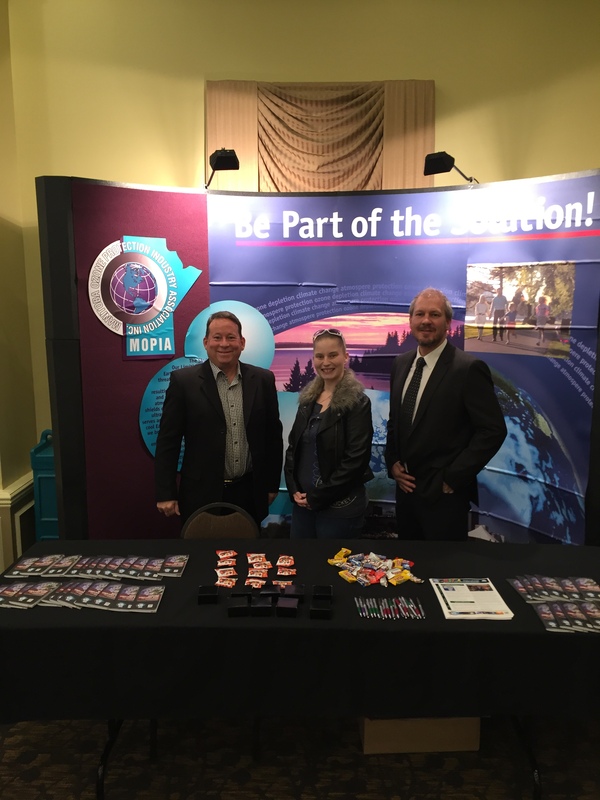 MOPIA’s 24 th Annual General Meeting (AGM) was April 10, 2018 in Winnipeg. Our 24th Annual Report can be accessed below. The Ozone-depleting Substances and Halocarbon Alternatives Regulations, published in Part II of the Canada Gazette on Wednesday June 29, 2016, will come into force on December 29, 2016 and will repeal and replace the Ozone-depleting Substances Regulations, 1998. The 23rd Session of the Conference of the Parties will be meeting in Bonn, Germany: 6-17 November 2017. Follow the meeting via IISD and the UNEP Ozone Secretariat via the links below. 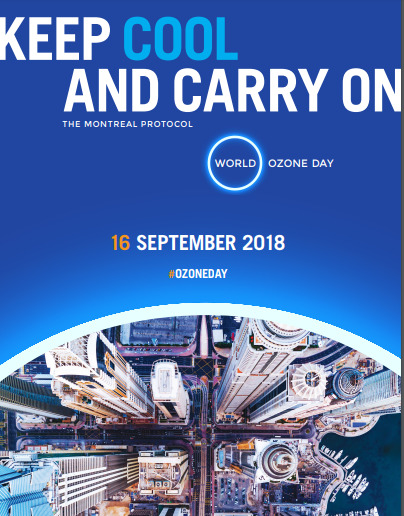 The United Nations General Assembly proclaimed 16 September the International Day for the Preservation of the Ozone Layer, commemorating the date, in 1987, on which the Montreal Protocol on Substances that Deplete the Ozone Layer was signed. The Ozone-depleting Substances and Halocarbon Alternatives Regulations were published in Part II of the Canada Gazette, on Wednesday June 29, 2016. The Regulations will enter into force 6 month after its publication. To be posted in April 2019. Attached is a past form, for your reference. Important meetings are happening in Vienna, Austria 15-23rd July, 2016 to discuss and finalize a pathway forward to deal with potent GHG HFCs. 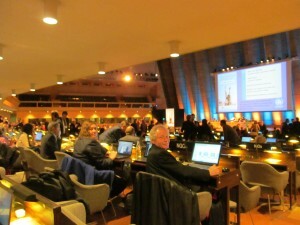 An important international meeting took place in Dubai to discuss HFCs and Amendments to the Montreal Protocol. MOPIA’s Chair and Executive Director attended to keep aware of developments. MOPIA’s 21st AGM successfully Held! 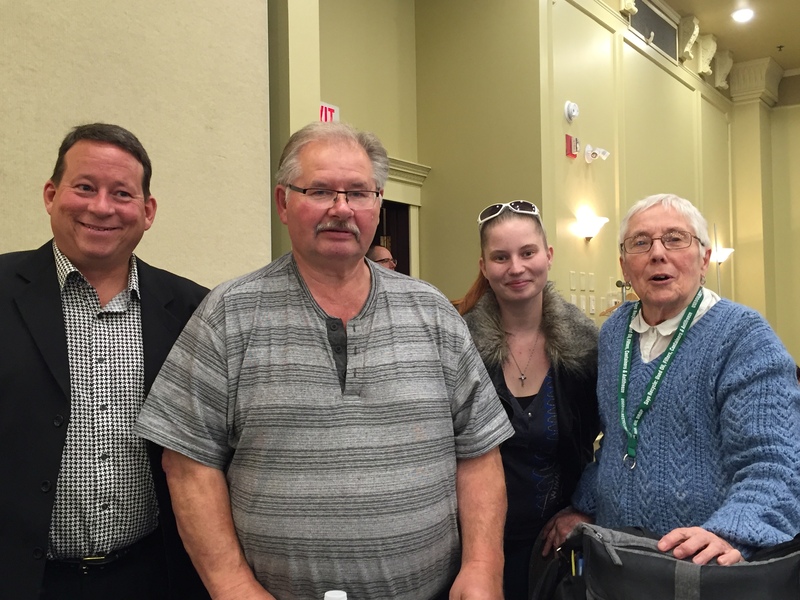 MOPIA’s 21st AGM was held on Monday, March 23 in Winnipeg. Environment Canada hosted a consultation session and is planning some webinar sessions with selected industry sectors on HFCs and MOPIA was well represented with our Executive Director and Chair of the Board. On December 6, 2014, the Minister of the Environment published a Notice of Intent to develop proposed regulations under the Canadian Environmental Protection Act, 1999 to control the manufacture, import and use of hydrofluorocarbons (HFCs) in Canada. Included in the Notice of Intent was a commitment to consult with representatives of provincial and territorial governments, industry, non-government organizations and other interested stakeholders. Questions regarding the consultation process should be addressed to Stephanie Bourgeau at (819) 938-4235 or Stephanie.Bourgeau@ec.gc.ca. MOPIA’s 2016 Edition of our Manitoba Regulatory Compliance Guide can be seen/accessed below. It is a valuable reference tool for industry and stakeholders who encounter the various regulated (ODS and Halocarbon) products. It’s here to download and share…..
Let MOPIA know (mopia@mymts.net) if you have any suggestions for improvement for any future edition. 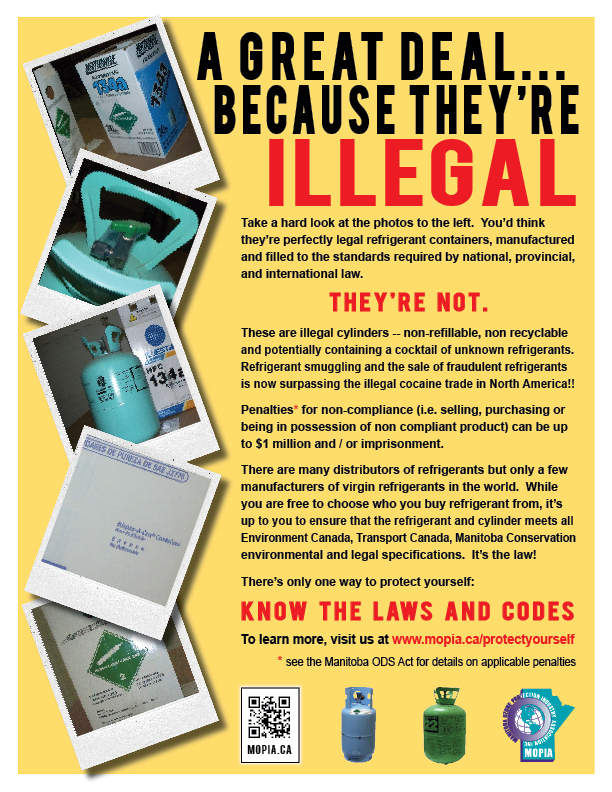 While the refrigerant manufacturer is legitimate, the refrigerant cylinder is a “Dispos-A-Can” and this is not allowed in Manitoba and certain other provinces. 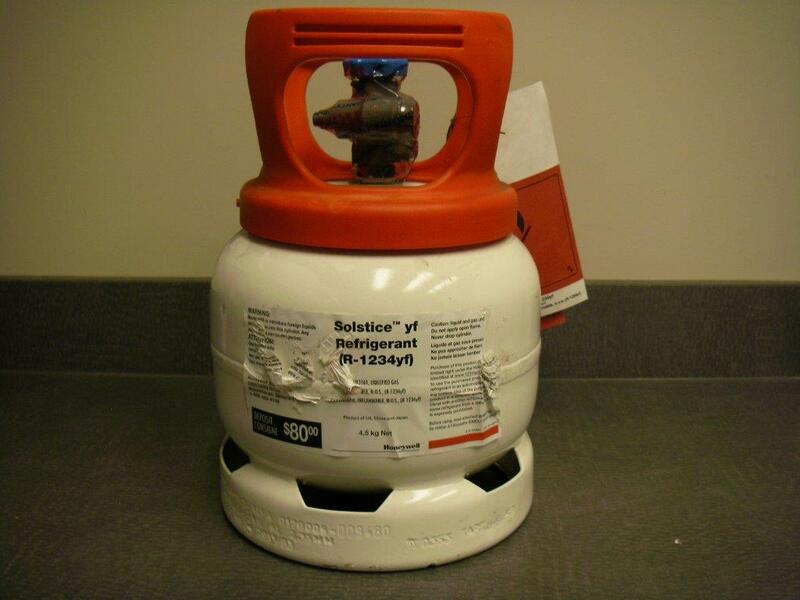 Ensure the cylinders you buy are refillable and from a safe source. Likley all will have a core charge (deposit) and the seller has to accept them back for recycling. MOPIA offers our next training session as soon as we have enough applicants. So, if you are interested, let us know. You may register by contacting us by email (mopia@mts.net) or phone (204.338.2222/1.888.667.4203) or by filling out the registration form under “Training”. The cost is $185.00. MOPIA’s 21st AGM was March 23, 2015. Another Year of Success! 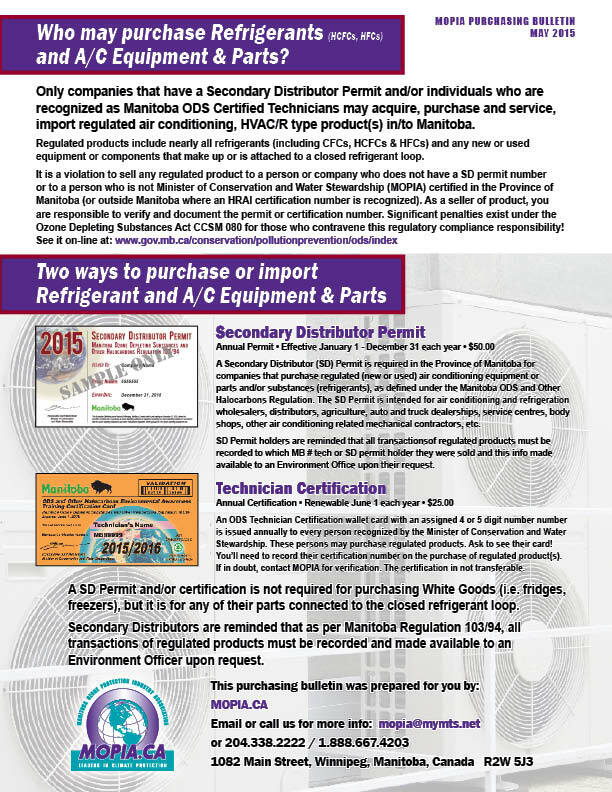 The sale of new or used A/C parts and equipment intended to contain a class 1,2 or 3 substance is restricted to SD Permit holders (companies) and persons holding a valid Manitoba ODS certification. Download one of our latest Purchasing Bulletins below. 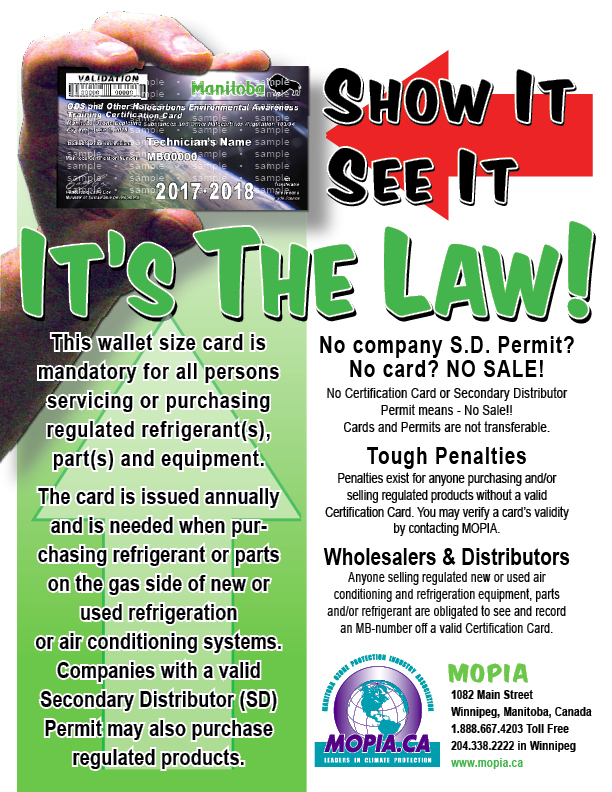 Retailers are obligated to comply with the same legislation as air conditioning contractors and wholesalers. 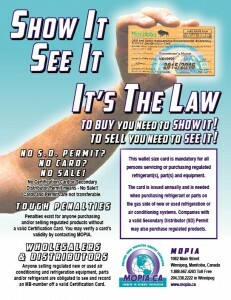 Retailers may only sell regulated products (i.e. 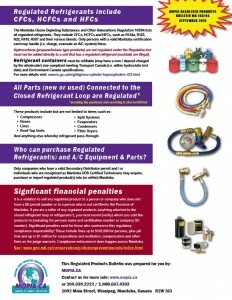 split A/C units, regulated refrigerants and parts connected to the closed refrigerant loop) to those who are certified through MOPIA and to companies that hold a valid Secondary Distributor Permit. 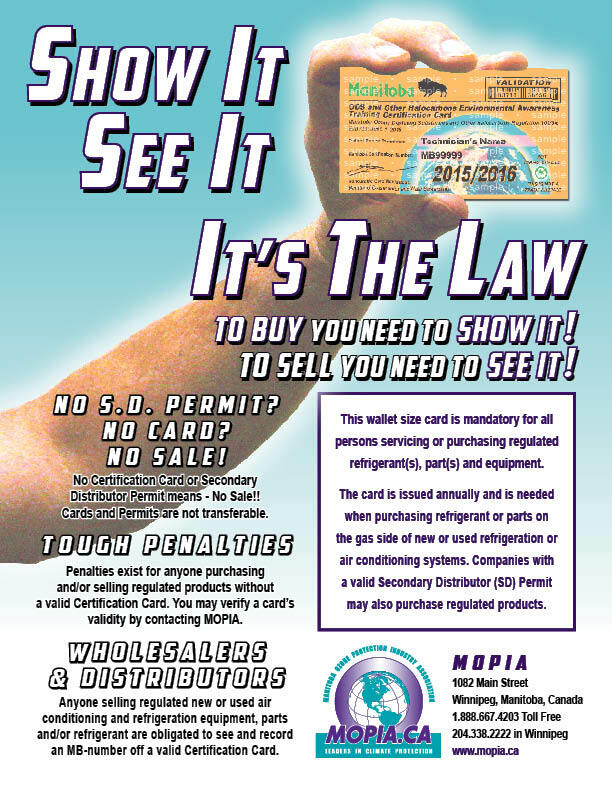 Retailers must also hold a Secondary Distributor Permit if they are importing regulated products into Manitoba. MOPIA will be developing further information for consumers, retailers and wholesalers soon. Contact MOPIA if you require further info. Techincian Record Data sheets are due by February 1. 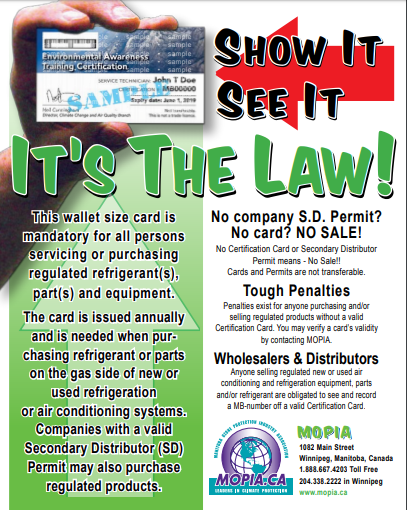 All refrigerant use must be recorded and submitted to MOPIA. If you need assistance on how to complete them, let us help. Here is the form. You may use this one or make your own but make sure all the info is displayed. MOPIA moved to 1082 Main Street, just south of Redwood and at Aberdeen Avenue and on Main Street in October 2011. Our phone number is 204.338.2222. Skin cancer is the most common cancer in Canada with an estimated 74,100 new diagnoses of non-melanoma skin cancers in 2011. Another 5,500 will be diagnosed with more serious melanoma skin cancer. So remember when the UV’s high, slip on a shirt, slop on sunscreen, and slap on a hat. Manitoba Hydro residential customers can now save energy and money by getting rid of their old, working second refrigerators. Hydro customers can be paid $40 for a working refrigerator that’s 15 years old or more, including free in-home pick up. It’s important to keep up-to-date on UNEP’s efforts, as we continue to see news of increasingly thin ozone layer coverage in the Arctic. Environment Canada released an updated Federal Code of Practice in April 2015. Next date is TBA. Watch for several new dates soon. The Arctic & the Ozone Layer: Stabilizing our environment and climate. 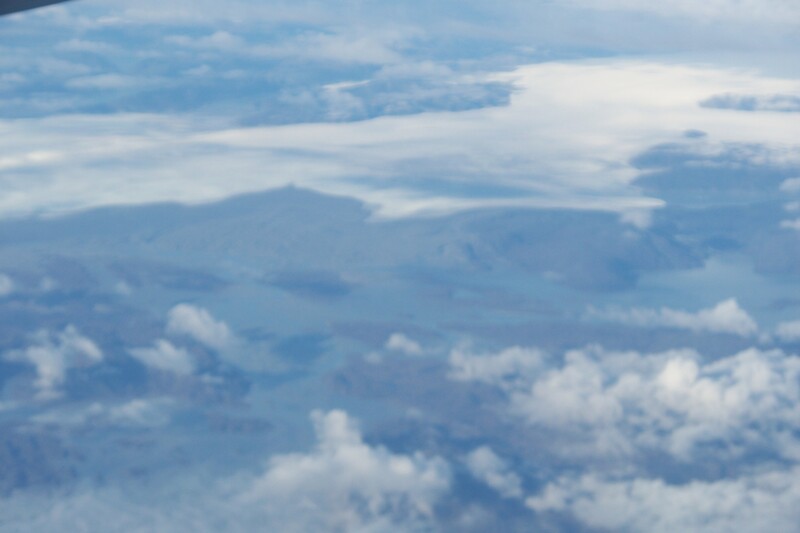 In 2011, extremely low ozone levels were recorded in the Arctic. 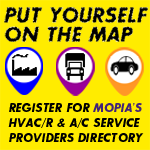 MOPIA has found that certain large auto dealerships are beginning to receive new 2014 vehicles with new refrigerant HFO 1234yf within their air conditioning systems (containing a refrigerant charge of 1.2 lbs). The refrigerant comes in cylinders of 4.5 kg, much less than the typical 30lb cylinder for previous refrigerants HFC 134a and HCFC 22, as the cost for HFO 1234yf retail is approximately $140/lb. We are told this new refrigerant requires a different recovery machine than that for HFC 134a or risk damage to the unit. HFO 1234yf is noted as flammable. MOPIA regrets to announce the passing of our former Chair, Board member and current Secretary on the Executive Committee, Mr. Bill Taylor, on August 26 in Winnipeg. Bill has been a fixture within MOPIA since day one, for nearly 20 years. He was an invaluable source of knowledge and insight. We extend our condolences to his family. 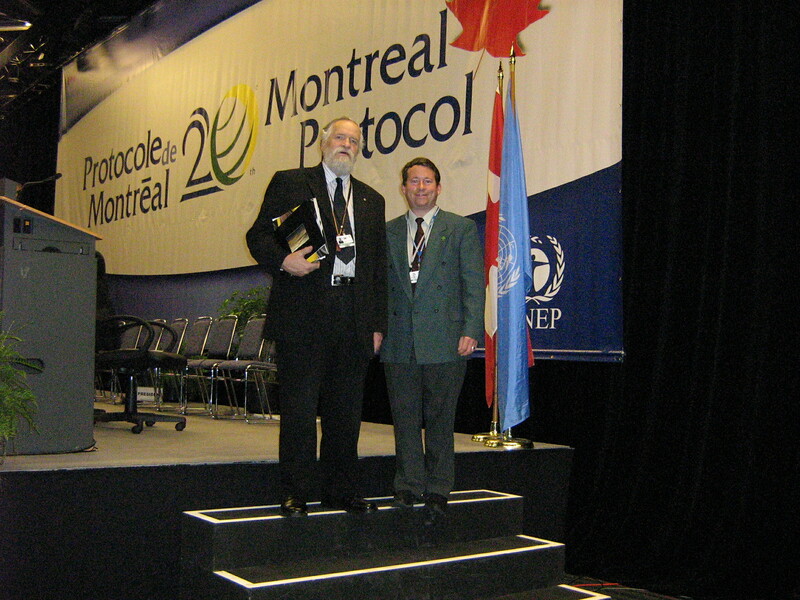 Bill is seen here (at left) at the 20th Montreal Protocol Meeting. You are encouraged to attend one of several awareness sessions being held across Manitoba beginning in June. These events are free, include a complimentary meal and refreshments as well as about an hour of information including a chance to voice your suggestions or concerns. Pre-register by downloading the form below and returning it to MOPIA in advance. 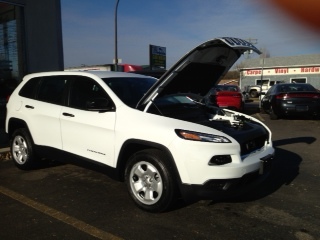 So far, MOPIA has been to: Steinbach, Morden/Winkler, Portage la Prairie and Selkirk, Winnipeg, Dauphin and Brandon. Our next sessions are being planned for Flin Flon, Thompson and The Pas (September 2013). Addition locations may be added, where enough interest is identified. 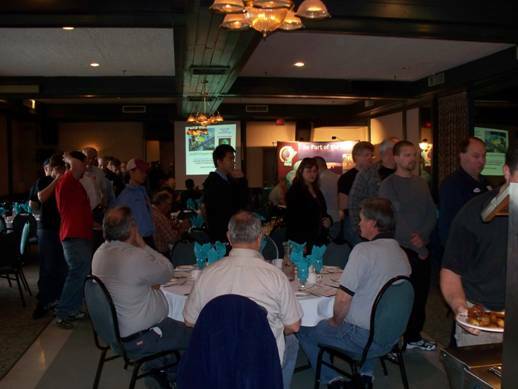 MOPIA’s 19th AGM was held on Monday, April 22 in Winnipeg at a special venue, MACDON Industries. There were a few proposed Bylaw amendments adopted, these can be seen below. Our 20th AGM is April 21, 2014. Mark your calendar! 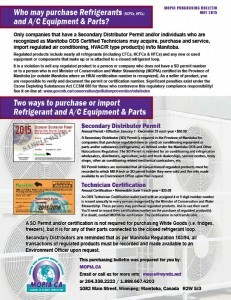 Manitoba’s Ozone Depleting Substances and Other Halocarbons Regulation 103/94 restricts the sale and purchase of a variety of refrigerants and any new or used part(s) connected to the closed refrigerant loop.